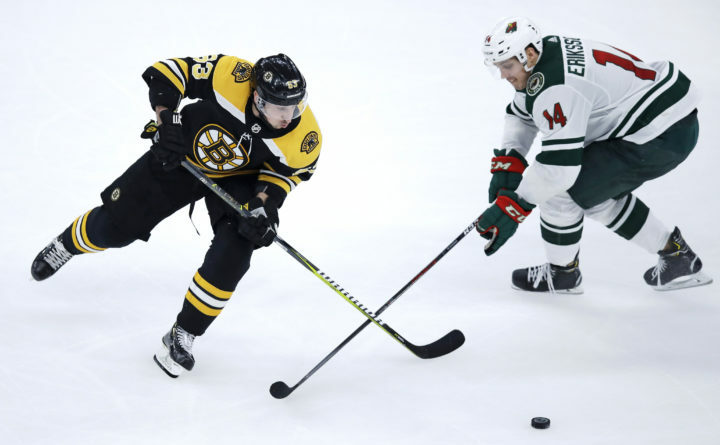 Boston Bruins left wing Brad Marchand, left, skates around Minnesota Wild center Joel Eriksson Ek (14) as he turns toward the net during the third period of an NHL hockey game in Boston on Tuesday. BOSTON — Tuukka Rask was happy to share the credit after his first shutout of the season. Patrice Bergeron and Brad Marchand each had a goal and two assists. Danton Heinen and Jake DeBrusk also scored as Boston won its season-high fifth straight game. John Moore and Torey Krug had two assists apiece. Alex Stalock finished with 23 saves for Minnesota. The Wild, who played Monday night in Montreal, managed just six shots in the first period and never recovered after Boston took a 2-0 lead on goals by Heinen and Marchand. Rask earned his first shutout since blanking Tampa Bay on the road last March 17. He wasn’t tested often, but did come up with a big glove save on Eric Staal with 5:42 left in the first. After stopping 12 more shots in the second period, Rask faced only seven from the weary Wild in the third and completed his 42nd career shutout. Rask needs three wins to break Cecil “Tiny” Thompson’s club record of 252. Boston jumped on Minnesota early and never let the Wild get much going offensively. Heinen tipped in Moore’s shot from the point 5:23 into the game and Marchand scored from nearly the same spot on a rebound off the end boards after a shot by Bergeron with 8:31 left in the period. DeBrusk added a power-play goal with 45 seconds left in the first when the puck bounced off his chest. The assists went to Bergeron and Marchand, who combined again for Boston’s next goal. Minnesota’s Zach Parise was called for tripping 6:05 into the second and the Bruins scored just 19 seconds into the power play when a shot by Marchand glanced off Bergeron’s skate into the net. Bergeron was credited with the goal, while Marchand and Krug both picked up their second assist of the night. The Wild, playing the second night of back-to-back games, wrapped up a 3-1 road trip. Boston D Charlie McAvoy missed his sixth straight game with a lower-body injury. … Stalock got the start for Devan Dubnyk, who made 32 saves Monday night at Montreal for his first shutout of the season. Dubnyk will represent the Wild at the All-Star Game for the third time in four seasons. … The Wild fell to 8-4 in Boston. Wild: Host the Winnipeg Jets on Thursday night. Bruins: Host the Washington Capitals on Thursday night.